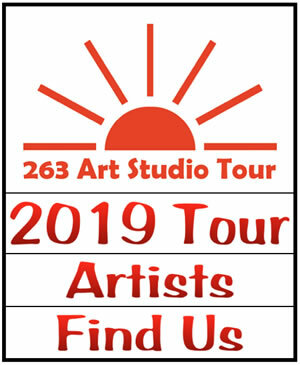 The 263 Art Studio Tour enters its seventh year in 2019. We are pleased with the positive reactions of our Tour Guests and we plan to do an even better job. To enable our visitors to better enjoy their experiences on the 263 Art Studio Tour we need to have your feedback. We have listened to you and we hope that your next 263 Art Studio Tour experience will be even better than before. Our fifth and sixth seasons in 2017 and 2018 were blest with good weather and a completed highway 263. What relief to all. Our fourth annual tour (2016) encounterd bad weather and even worse roads as reconstruction of Highway 263 made for very difficult conditions. There is just a very short portion of that project still to be paved and we are assured it will be completed in the spring of 2017, well before our tour dates. Our tour continues to attract new visitors and also sees the return of patrons from years before. We are so pleased by the quality of our partistipating artists and also of our visitors. We are delighted to meet with you and to talk about what we do as artists in this Lakeland area. The third annual tour (2015) had 18 artists consolidate at 10 sites. Despite road construction concerns on Highway 263 the weather was great. The Tour dates were July 25 and 26, 2015. The Tour website was moved from a .com to a .ca and underwent a restructuring and expansion not possible with our previous web-hosting service. The artists who organized and staged the 2013 Woodland Studio Art Tour presented the 2014 version, renamed 263 ART STUDIO TOUR. The name changed, but the idea is the same — to open our studios and homes to those interested in exploring the artistic excellence and variety in our area. For our first annual tour, the event was named Woodland Studio Art Tour and was held the 17 - 18 August 2013.There were 15 artists at 11 sites. Summer's Past Greenhouse was a group venue for three artists. Sites were marked with a red "W".